Custom Photo PenPeeps Add a New Dimension to All Arts & Crafts! Our custom photo PenPeeps are stanhope micro-photos that we make from your own photos. The best photos to have made as PenPeeps are the ones you and your customers love most. So have your favorite photo or snapshot transformed into a high resolution stanhope PenPeep today! Stanhope PenPeeps are beautiful, functional and very affordable. They add value, sentiment & intrigue to anything you put them in. They can be used in a variety of items and with a bit of imagination you can transform everyday objects into exiting keepsakes that will be cherished for a long time. Use PenPeeps to adorn and embellish anything you can drill a hole through. Use them in things like jewelry, musical instruments, greeting cards, photo frames & everything you make. 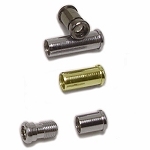 They are quick and easy to install in products made from wood, acrylic, plastic, resin, metal, castings items & more. Our Artist Gallery is a good place to get ideas for your projects. PenPeeps create new markets for your art. Custom Photo PenPeeps turn any craft work into an instant keepsake that's sure to be cherished for years to come. Great idea for pet and family photos. Preserve a moment in time forever with PenPeep Custom images. The possibilities are endless! Specially priced for a limited time. Get yours Today!